Do we provide Airport Transfers? Yes, one way limousine and Van airport transfers are provided at Baht 1,150++ and Baht 1,400++ respectively. Limousines seat up to 3 people per vehicle and Vans seat up to 6 people per vehicle. Yes, we provide a free scheduled shuttle bus service to Central shopping centre, Patong and Nai Harn beach once per day. Yes, parking spaces are available to guests free of charge. Can we rent a car or scooter? Yes, you can either rent vehicles and motorbikes locally or at the airport. One of our front desk team would be pleased to help should you require. CAUTION: Driving on a motorbike in Thailand is very dangerous if you have not driven a motorbike before and therefore is not recommended. Could we have an extra bed in the room? Yes, extra beds are available in all room types except the Serenity Room. Extra beds for adults are available at Baht 1,500++ per adult including breakfast and Baht 750++ including breakfast, for children under 12. Children below the age of 4 are free in either an extra bed, cot or sharing with Parents. Guests can Check-in at 14:00 and Check out is at 12:00. Is there a late checkout policy? Yes, you can check out late, before 6PM, there will be a half night charged, after that, there is an extra night charged. However, late checkout is subject to availability. Yes, babysitting is available at a charge of Baht 400++ per hour per child until mid-night and Baht 600++ per hour per child after mid-night. Is there Internet at the hotel? Yes, there is an Internet Corner with PC's available for guests and there is also Wireless Internet throughout the resort, available free of charge. Are there any activities available? 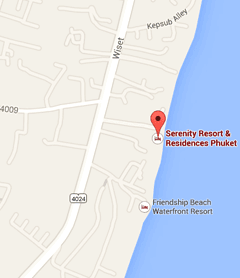 Yes, there is an extensive range of tours and trips available in Phuket. Our in-house tour specialist is available to help make your holiday a memorable one.